Some eateries have that magic formula, and it’s obvious that European Café on the Parade, Norwood has it. 36 years in business is evidence enough! This casual, busy café has maintained its popularity by continuing to serve delicious, hearty home-style Italian food with lashings of old fashioned Italian hospitality. I’ve been there a number of times over the years and I keep returning, as do many others. It’s a relatively simple interior – tiled floor, wooden chairs and tables, including a few booths (who doesn’t love a good booth! ), and there’s glass dessert and gelati cabinets. Yes, it can get pretty noisy on a busy night and you have to shout at each other across the table, but as long as you know that it’s probably not the best place for a quiet romantic rendezvous then that’s fine. You’ll find people of all ages dining here, and earlier on in the evening, it’s a popular family destination. The menu includes all of the traditional Italian favourites – pizza, pasta, risotto, carpaccio, arancini, calamari, plus chicken, veal, steak and fish mains. A serve of complimentary pizza bread arrived at our table – a nice touch. We started with some pea, mozzarella and saffron arancini balls with a tomato salsa. I’m not usually a huge arancini fan (I often find them quite stodgy and they fill me up) but I loved these ones! Even though they’re quite cheesy, they’re light and not too rich. They’re moist, the salsa is nice, and they leave you wanting more! We followed this with the Beef Carpaccio with caramelised onion, rocket and a citrus dressing. The sweetness of the onion really makes this dish. 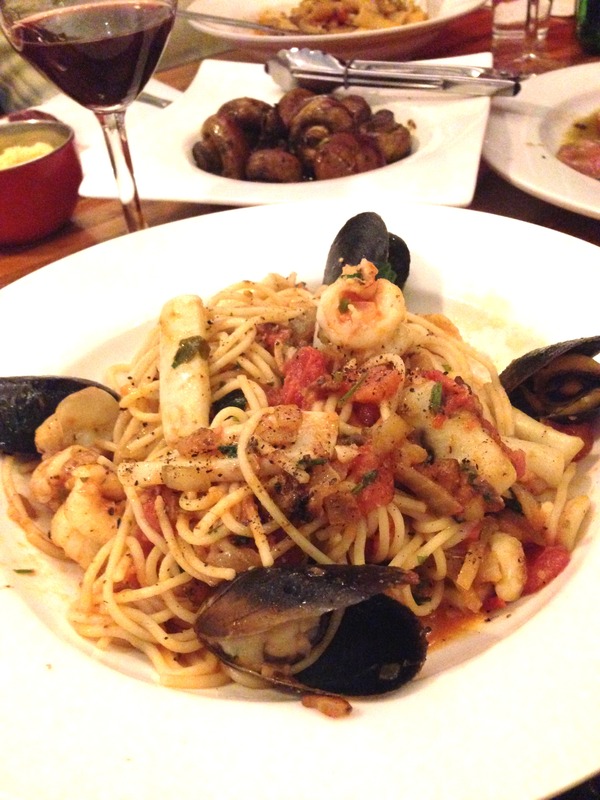 For a main, I really can’t go past the Spaghetti Marinara – it’s one of the best ones I’ve found in Adelaide – a decent size, laden with squid, prawns and mussels. The mussels are still plump and the sauce has a lot of flavour. The pasta is cooked a little past al dente, but it’s still good. Other dishes ordered at our table included the Linguini Granchio (crab meat with chilli, onion and baby spinach). This dish had just the right amount of chilli, and the crab tasted fresh. The Rigatoni con Pollo (chicken, bacon, mushrooms, tomato, cream and parmesan) was super tasty with lots of sauce, and the Saltimbocca (veal medallions with proscuitto, cheese and sage) was also full of flavour. Everyone was extremely happy with their dishes, and the side dish of oven roasted balsamic mushrooms was pretty much perfect – really meaty, gorgeous mushrooms. Onto desserts – I’m not really a big dessert fan, but this night I was convinced by my fellow diners that I simply had to order the Tiramisu and I wasn’t at all disappointed. The other dessert we ordered was the White Toblerone with orange semifreddo with warm chocolate cake – also really good. Some other things that I like about European Café – there are some good wines at good prices, plus there’s a great range of wines available by the glass. Also, you can BYO for $15 a bottle. The other bonus – you can use your Entertainment Card! How did that spaghetti marinara compare with Maldini’s??? ?